With the deadline for 40 man roster additions set for Tuesday, the Phillies made moves to add some promising names to their list of protected players. The Phillies announced the additions of shortstop Arquimedes Gamboa along with right-handed pitchers Adonis Medina and Edgar Garcia are the players added to the Phillies roster. Gamboa, a native of Venezuela, is a talented defender who played in the Arizona Fall League over the past month, sprinkling in some time at third base there, though his bat doesn't feature enough pop to think he will be an impact guy at that position. Gamboa, a 21-year-old switch hitter, posted a .214/.304/.279 slash line with Class A Advanced Clearwater this year. Medina, a 21-year-old Dominican, is one of the Phils' top prospects and is always a name that pops up when fans and media discuss big trade proposals. With Clearwater this year, Medina tallied a 10-4 record, a 4.12 ERA and a 9.9 K/9 in 22 games (21 starts). Garcia, a Dominican Republic native, turned 22 years old this off-season. He stood out as an All-Star reliever for Double-A Reading last year, sporting a 3.32 ERA and a 10.3 K/9 mark over 47 appearances there before earning a promotion to Triple-A. Garcia features a fastball-slider combination that the Phillies like out of the bullpen. OF Jose Pujols- Powerful slugger, strikes out a lot. The 23-year-old righty batter had a great 2018 campaign, posting a .295 average with 22 homers and 76 RBI in 121 combined games at Class A Advanced Clearwater and Double-A Reading. Catcher Deivi Grullon- Double-A Eastern League All-Star home run derby winner this year. The 22-year-old went without a hit in eight games for the Aguilas in the Dominican Winter League and is no longer active there. RHP Luke Leftwich- The 24-year-old showed promise this year at Double-A, posting a 3.73 ERA and a 10.3 K/9 in 44 appearances. Leftwich did not allow a run in eight appearances in the prestigious Arizona Fall League. 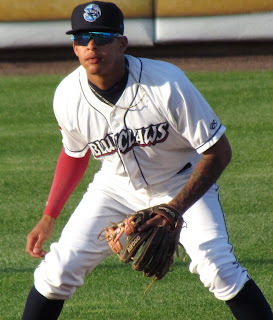 Second baseman Daniel Brito- An outstanding defender,the 20-year-old split time at Class A Lakewood and Class A Advanced Clearwater this year. He's likely too far from a finished product for the Phillies to feel he'll be taken by another team. LHP Tyler Gilbert- The guy I thought was among those that would be protected. Lefties are always a hot commodity, so I thought Gilbert, 24, stood a good shot at earning a spot and being protected. Gilbert had a solid campaign this year, splitting time with Reading and Triple-A Lehigh Valley. Once a player is chosen, that player is automatically assigned to his new organization's 40-man roster. A Rule 5 player must remain on the selecting team's 25-man big league roster for the entire next season, or be offered back to his original team. The Phils' 40-man roster sits at 38 players currently, so they'll have room to add some individuals in the coming weeks.